Chef Kim Yeong Gon cooks wagu beef during a tabletop demonstration inside the Bull Pan Korean BBQ at 485 Summer St., in downtown Stamford, Conn., on Monday, May 7, 2018. Growing up, Paul Ma watched his parents hone their craft on two continents. Now, he has taken the lessons he learned to follow in their footsteps on a third. Ma opened last week Bull Pan Korean BBQ, in a new 3,500-square-foot storefront at 485 Summer St., representing what he says is Fairfield County’s first Korean barbecue restaurant. He drew the inspiration for his first eatery from similar establishments that his parents ran when the family lived in Seoul and Buenos Aires, before they relocated when he was 14 to Queens, N.Y. Patrons can expect to sample during any meal an array of meats, many of which come from an Oklahoma farm. A dinner beef combo, for two to four people, would include sliced brisket, marinated short rib, as well as rib-eye or boneless short rib. Pork combos include pork belly, marinated pork ribs and sliced, spicy pork. Servers cook the meats on tabletop grills. A super flavorful steak marinaded in only 10 minutes, combined with rice and pickled vegetables. Dinner meals typically include around 10 side dishes, including kimchi seasoned vegetables, bean sprouts, seaweed, spinach, radish, onions, snow peas and corn cheese. The vegetables help to balance the meats’ fatty content. Bull Pan Korean BBQ, at 485 Summer St., is open Monday through Thursday, from 11:30 a.m. to 10:30 p.m.; and Friday through Sunday, from 11:30 a.m. to 11:30 p.m. For more information, call 203-569-9618. The meats are supposed to be folded in wraps — using lettuce and other sides as the outer layer, and adding sauces and other toppings such as rice to the meats. Dinner combos also come with stews such as brisket soybean paste, kimchi and spicy soft tofu. Appetizers include dumplings, noodles and seafood, beef and kimchi varieties of pancakes. Bull Pan’s name refers to how the grill is described in Korean, Ma said. The logo doubles as a bull’s head and a flame. With its floor-to-ceiling windows, Bull Pan’s opening has not escaped the attention of passers-by. 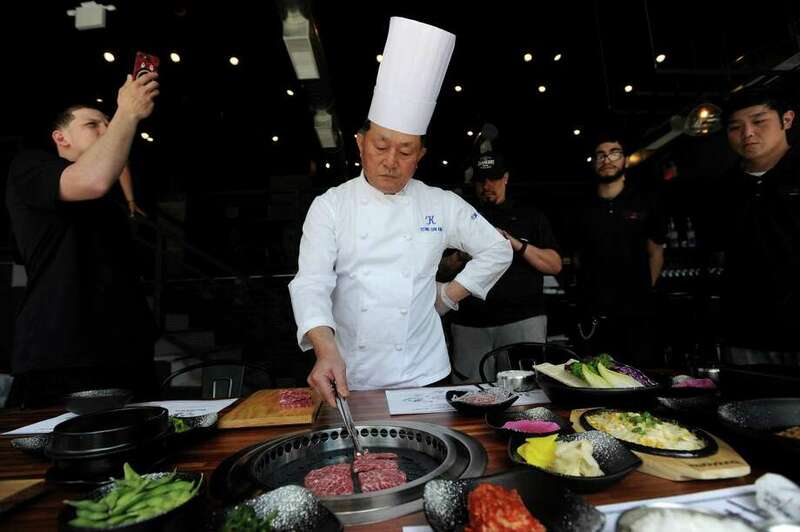 A crowd of about a dozen pedestrians gathered in front of the window to watch and snap pictures with their phones of a tabletop demonstration last week by chef Kim Yeong Gon, who has cooked Korean barbecue for more than 40 years. In total, Bull Pan would initially employ 15 to 17, Ma said. Ma, who lives in Wilton with his wife and 2-year-old daughter, said he was drawn to downtown Stamford by its diverse dining scene. He previously worked in the cell phone and credit-card processing industries. The restaurant’s neighbors in the same block include the Greek restaurant Eos, Mexican restaurant Cantina Mexicana, Italian restaurant Siena and Japanese restaurant Kotobuki.